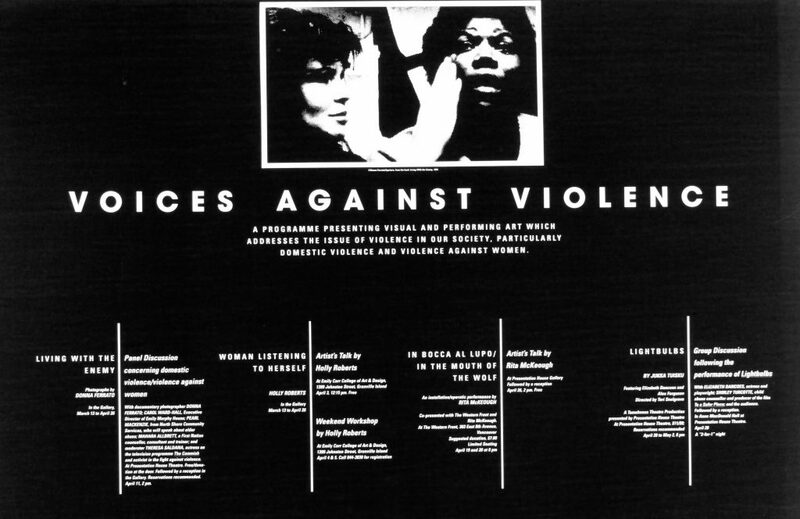 During March and April the gallery presents a series of exhibitions and special events focusing on domestic violence - the most widespread and menacing undercurrent in our society. Internationally renowned photojournalist Donna Ferrato, has captured disturbing scenes of domestic violence: from emergency rooms, support groups, women's shelters and even the homes of victims. The women portrayed in Living with the Enemy are not just victims, but survivors, finding within themselves the strength and courage to break the cycle of violence. Panel Discussion Regarding Domestic Violence/Violence Against Women, with documentary photographer Donna Ferrato; Carol Ward-Hall, Executive Director of Emily Murphy House; Pearl Mackenie from North Shore Community Services, who will speak about elder abuse; Judi, a survivor of abuse; Mahara Albrett, a native counsellor and consultant; and moderator, Julie Brown, broadcaster and activist. April 28: May 2, 9:00 p.m.
A discussion following the play Lightbulbs, with Elizabeth Dancoes, actress/playright; Alex Ferguson, actor; Shirley Turcotte, child abuse counselor and subject; coordinator of the film To A Safer Place, and the audience. In Boca Al Lupo / In the mouth of the Wolf. Rita Mckeough. An installation /operatic performance. Co- presented by Presentation House Gallery, The Western Front, and Rita Mckeough. Artist’s talk by Rita McKeough, followed by a reception. Free. The March / April exhibitions and Voices Against violence Programme of events are sponsored by the Van Dusen Fund, Vancouver City Savings Credit Union, the United Way New Ventures Fund through North Shore Neighbourhood House, Gastown Printers, the Vancouver Sun, the Government of BC through the Ministry of Women’s Equality, and the Canada Council. Poster for the exhibition "Living with the Enemy"